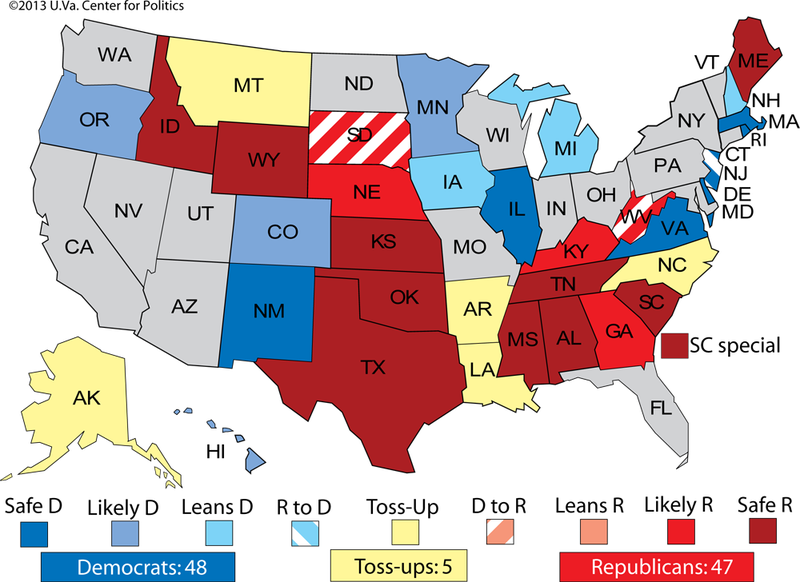 Larry J. Sabato's Crystal Ball » Senate 2014: One direction, but how far? This concludes our four-part update of the 2014 electoral environment. First, we proposed that 2014 might end up being a little like 1986; next, we described the narrow battlefield in the House and why Republicans might have a better chance to make gains than Democrats; then, we noted that a high level of gubernatorial incumbency might limit turnover; finally, below, we break down the state of play in the Senate. It’s too soon to see which way the Senate winds will be blowing in the fall of 2014. 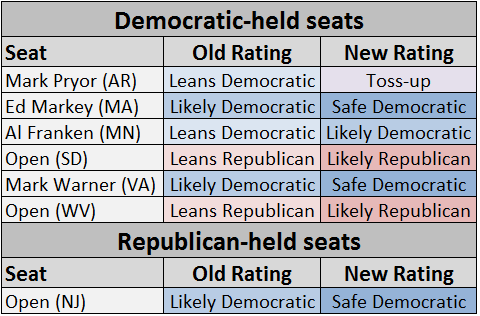 But unless conditions somehow change drastically, one thing seems certain, even 18 months out: The seat flips will be mainly or entirely in one Red direction. Right now, Democrats aren’t seriously contesting any Republican seat (excluding New Jersey), while the GOP has an excellent chance to flip two Democratic seats (South Dakota and West Virginia) and at least a fair chance in four other states (Alaska, Arkansas, Louisiana and North Carolina). Republicans, there’s your good news. Nothing in politics is static for long, and we expect a shift here and there. For example, if the Republicans nominate far-right Reps. Paul Broun or Phil Gingrey in Georgia, then prospective Democratic nominee Michelle Nunn could actually have a shot at a seat in the congressional chamber her father, Sam, once helped run. On the other hand, if former Gov. Brian Schweitzer (D) surprises everyone and doesn’t run for the open Senate seat of retiring Democrat Max Baucus in Montana, Republicans will have another likely pick up. So we recognize that the chess board is not yet fully assembled. What’s unusual is that, already, there are far more Red chess pieces on the board than Blue, and in better strategic positions. Since 1954, there have been nine (out of 30 total) cycles where one party didn’t flip a single Senate seat held by the opposing party. These flat, “zero-base” Senate elections have hurt both parties at different times: the Democrats in 1980, 1994 and 2010, and the Republicans in 1958, 2006 and 2008 (all were wave years). The three other instances were years of little movement: in 1960, Republicans flipped two Democratic seats while Democrats flipped none; in 1966, Republicans won three Democratic-held seats while the Democrats didn’t add any; and in 1990, Democrats netted a single Republican seat while the Republicans didn’t win a single Democratic seat. Obviously, in the event that Democrats can’t flip any Republican seat, they’d prefer to limit their damage, as in 1960 or 1966. Republicans want a repeat of 1980, 1994 or 2010: a wave election where all or almost all the tight Senate races fall in their direction. They argue that Obama’s popularity is already dipping, scandals are taking their toll, and the lack of much action (helped along by GOP intransigence in the House) will produce the dreaded “sixth year itch” — dreaded, that is, by the incumbent White House party, because the out-of-power party gains lots of seats when the phenomenon occurs. The recent, best instances of sixth-year itch have all helped the Democrats — 1974, 1986 and 2006 — so maybe Republicans are due some turnabout as fair play. Democrats counter that an improving economy will be a balm for “the itch,” and voters won’t take retribution against the majority party if they are basically happy. In addition, Democrats point to 1998, when Bill Clinton’s scandals were supposed to produce a sixth-year itch — and it didn’t happen because of GOP overreach on impeachment and a good economy. President Obama’s party senses possible voter retribution for the increasingly obvious (in their view) GOP gridlocking in Congress; you can’t stop progress, they say, and Republicans will pay a price for doing so. They can also point to 2012 as a year in which they made Senate gains on a seemingly poor playing field, although this map is worse for them on paper. But odds for what? Republican gains, sure. It will be a gigantic shock if the GOP doesn’t pick up two or three seats, net, in November 2014. But Republicans need six seats, net, to take control of the Senate. (We’re assuming here, as almost everyone does, that Democrats re-capture the late Sen. Frank Lautenberg’s seat in New Jersey in the October special election.) We won’t torture our Republican readers by reminding them in detail of the half-dozen or more seats they threw away in 2010 and 2012 by selecting poor candidates in races they ought to have won in Colorado, Delaware, Indiana, Missouri, Nevada and North Dakota. If the party base had used more sense, they’d already be defending a Senate majority. But what’s past is past. The GOP’s problem is that few campaign analysts will be surprised if they forfeit another seat or two in the current cycle because of factional in-fighting or by selecting ideologically pure but unelectable nominees. One could argue the GOP has already waved bye-bye to a potential seat pick up in Iowa by dithering, and then there’s the Georgia case we’ve mentioned, above. The Republicans’ prospects also don’t look that great in several other contests that could be competitive: an open seat in Michigan, for instance, and also ones against incumbents in Colorado, Minnesota and New Hampshire. But it’s still early. The long and short is that Republicans are very likely to be able to boast of Senate gains on election night 2014. Yet everything — and we mean everything — will have to fall just right for them to be able to brag about a new Senate majority. Is it possible? Certainly — this far out, most things are. Is it probable? The odds for a GOP Senate are a lot better than you’ll get playing Powerball, but that’s the most Republican-friendly way you can put it for now. Note: For a full breakdown of the races and a list of possible candidates, click here. Alaska: Joe Miller (R) is back and ready to take another shot at a Senate seat in the Last Frontier. In 2010, the Tea Party-backed Miller defeated Sen. Lisa Murkowski (R) in the GOP primary, only to lose to Murkowski’s remarkable write-in effort in the general election. But in the aftermath of 2010, Miller is now viewed relatively unfavorably by Alaska Republicans — a May survey found he had a 34%/49% favorable/unfavorable rating among potential GOP primary voters. This is good news for Lt. Gov. Mead Treadwell (R), who made his bid for the seat official last week. Treadwell has already slammed his GOP opponent, saying “I believe I don’t scare people. Joe does sometimes.” But Treadwell is a Connecticut native with Harvard and Yale degrees — hardly a Wild West archetype. Not that he’s a carpetbagger — he has lived in Alaska for decades and is a highly regarded Arctic expert — but as National Review’s Robert Costa recently tweeted, “Mead Treadwell may be the most perfect name for an establishment fave in a Senate GOP primary. Like a character from a Chris Buckley book.” Miller or state Natural Resources Commissioner Dan Sullivan (R), who is still mulling the race, might be able to cast Treadwell as too establishment. Waiting for the eventual nominee is Sen. Mark Begich (D), who is trying to say and do all the right things to hold onto this seat. The incumbent recently described himself as something of a Rockefeller Republican, and he’s aggravated New York Mayor Michael Bloomberg enough over gun control that the Big Gulp-hating mayor pressured Democrats out of putting on a Big Apple fundraiser for the Alaskan. TOSS-UP. Arkansas: Sen. Mark Pryor (D) is taking heat from both flanks — conservatives say he’s in lock-step with President Obama, liberals say he betrayed his party on gun control. The truth, of course, is likely somewhere in between. Pryor is already running ads in Arkansas defending his vote against expanded background checks, stating that “No one from New York or Washington tells me what to do. I listen to Arkansas.” Considering nearly 61% of Arkansans voted for Mitt Romney (R) in 2012, Pryor is doing the only thing he really can do — run to the right on certain issues, like gun control, in order to maintain a shot at reelection. While he doesn’t have any declared opponents yet, Reps. Tom Cotton (R) and Steve Womack (R) are both considering the race, and many Republicans particularly want Cotton to run. Cotton, a favorite of the fiscally conservative Club for Growth, seems the likeliest challenger. It’s become clearer over the first half of 2013 just how vulnerable Pryor is, so we have moved this race into TOSS-UP territory. Georgia: Sen. Saxby Chambliss’ (R) retirement has opened up a seat that should be won by Republicans. And like flies to honey, there are already five GOP candidates in the field. Ex-Georgia Secretary of State Karen Handel (R) and Rep. Jack Kingston (R) are the establishment’s candidates, while socially conservative Reps. Phil Gingrey (R) and Paul Broun (R) are also seeking a promotion to the upper chamber. (Kingston is an ally of Republican Gov. Nathan Deal, while Handel narrowly lost to Deal in the 2010 gubernatorial primary.) Businessman David Perdue (R), cousin of ex-Gov. Sonny Perdue (R), is also in the race. While Gingrey has a tendency to stick his foot in his mouth, he has nothing on Broun, who has a long history of making controversial statements. The Democratic nominee will probably be non-profit executive Michelle Nunn, daughter of ex-Sen. Sam Nunn (D), unless some bigger names unexpectedly get into the race. Georgia’s other senator, Johnny Isakson (R), recently expressed fear that “a perfect storm” of factors could shift a relatively safe Republican seat into Democratic hands. A no-holds-barred, five-way GOP primary — which will likely go to a runoff — could result in the nomination of someone like Broun or Gingrey, which could put this seat in play. But it’s possible that determining the nomination by convention, which Georgia Republicans recently decided against, could have been even more unpredictable — just ask Republicans in Virginia. Barring Broun or Gingrey winning the GOP nomination, this race is LIKELY REPUBLICAN. But if either winds up being the Republican standard bearer, watch out. If Democrats are going to pick up any Republican-held Senate seat in 2014, this would probably be the one. Louisiana: Like her neighbor to the north, Mark Pryor, Sen. Mary Landrieu (D) is a Democrat who represents pretty conservative territory — Mitt Romney won nearly 58% of the Pelican State’s vote in 2012 — making her one of the most vulnerable incumbents in the country. At the moment, Rep. Bill Cassidy (R) appears to be her principal opponent for 2014, as Rep. John Fleming (R) has opted out of the race. Ex-Rep. Jeff Landry (R) has left the door open for a run but seems like an unlikely candidate. The early take on a Landrieu-Cassidy matchup is that it could be very, very close. Harper Polling, a conservative alternative to the liberally-aligned PPP, surveyed the still-hypothetical race in April and found Landrieu leading 46%-41%, underscoring the uphill battle Landrieu and other Democrats have in many Southern states where they have a high floor — mostly due to overwhelming African-American support — but a low ceiling that makes it hard to achieve a majority on Election Day. And let’s remember that in Louisiana, a plurality isn’t enough — the winner must get 50% plus one of the total votes. Alone among all the states, Louisiana’s election on Nov. 4, 2014 is actually a jungle primary. If no candidate receives a majority of the vote that day, the top two finishers advance to a runoff election on Dec. 6. Landrieu has been there a couple times: Of her previous three election wins, Landrieu only managed to get a majority in the first round of balloting once, in 2008. As for the number of candidates that will jump into this race, only time will tell. Besides Cassidy, the other GOP possibility we’re watching is state school board President Chas Roemer, son of ex-governor and one-time 2012 presidential candidate Buddy Roemer (R). But there could be a few other candidates, major and minor, competing next year — perhaps even Gov. Bobby Jindal (R), though we’re skeptical. While there were only five names on the ballot in 2008, there were nine in 2002. On the surface, it would make sense for Cassidy to prefer a larger field and, therefore, a runoff against Landrieu because turnout in the second round might be much lower than in the first. But evidence suggests otherwise: In Landrieu’s 2002 win, also in a midterm atmosphere, turnout fell less than 1% from the Election Day jungle primary to the runoff. This race features many complications, not to mention Landrieu’s difficulties with American geography, which is why we continue to categorize it as a TOSS-UP. Massachusetts: Fresh off his solid special election win this past Tuesday, Sen.-elect Ed Markey (D) will have to wait and see who wants to challenge him in 2014 in the seat’s regular election. It might be a re-match with the GOP’s Gabriel Gomez. While it became apparent during the special election campaign that Markey is not a particularly strong statewide pol, he is a Democrat in a very Democratic state, which means this race starts off as SAFE DEMOCRATIC. Montana: For a guy who supposedly hates Washington, D.C., ex-Gov. Brian Schweitzer (D) sure seems to be gearing up to run for the Senate in 2014. Schweitzer has been coy about whether or not he plans to get into the race, saying “I haven’t told anyone I’m running for sure.” Although Schweitzer recently became CEO of a mining company, that isn’t an indicator that’s he’s leaning against a run. In fact, reports have surfaced that he’s pursuing a “charm offensive” to win support from in-state allies of retiring Sen. Max Baucus (D), which would seem to indicate that Schweitzer is fully considering the race. His final decision on the contest matters a great deal to the many Republicans mulling the race: Polling indicates that Schweitzer would be an early favorite (depending on the opponent) to keep Baucus’ seat in Democratic hands, meaning his actions could attract or shoo away many in the GOP. Big-name possibilities such as Rep. Steve Daines (R), ex-Gov. Marc Racicot (R) and ex-Rep. Denny Rehberg (R), who lost to Sen. Jon Tester (D) in 2012, anxiously await Schweitzer’s decision. Tester, by the way, would “bet the farm” on Schweitzer entering the contest. Other Democratic possibilities include state Superintendent of Public Instruction Denise Juneau and EMILY’s List Pres. Stephanie Schriock. If Schweitzer runs, GOP big hitters like Daines and Racicot (who looks very unlikely to enter the race anyway) probably wouldn’t run; if Schweitzer doesn’t, the eventual Republican nominee will probably be favored in Big Sky Country. Everything rests on Schweitzer, and we know he loves the attention. This is a TOSS-UP for now, with a probable lean to Schweitzer if he makes the race. Nebraska: The surprising retirement of Sen. Mike Johanns (R) and the agonizingly slow decision by Gov. Dave Heineman (R) not to run for the seat put this race in a deep freeze from which it is only starting to emerge. Shane Osborn (R), an ex-Navy pilot who served a single term as state treasurer from 2007 to 2011, is in the race. The state’s three Republican U.S. House members — Jeff Fortenberry, Adrian Smith and Lee Terry — all appear unlikely to run, although that could change. A forever candidate, state Treasurer Don Stenberg (R), could make yet another run for Senate, as could state Attorney General Jon Bruning (R), although Bruning indicated earlier this year that he would like to stay on as AG (Bruning and Stenberg lost the 2012 Republican Senate primary to now-Sen. Deb Fischer). There are also several non-officeholder possibilities, including businessman Pete Ricketts (R), who got blown out by then-Sen. Ben Nelson (D) in 2006, and Ben Sasse (R), president of Midland University and a George W. Bush administration veteran. While Republicans could have a crowded primary, Democrats are still looking for a candidate: former Lt. Gov. Kim Robak and Lincoln Mayor Chris Beutler are often mentioned, but neither seems likely to run. Out of an abundance of caution given the uncertainty on both sides, we’re only calling this race LIKELY REPUBLICAN right now, but it would ultimately be an utter shock if this seat went to a Democrat. New Hampshire: The biggest news in this contest over the past several months has been former Sen. Scott Brown’s (R-MA) flirtation with running against Sen. Jeanne Shaheen (D). We think that if he runs for anything this cycle, it’ll probably be for Massachusetts governor. That leaves former Reps. Frank Guinta (R) and Jeb Bradley (R) at the top of the list of potential candidates, but there’s just not much going on here as of yet. The Granite State is another place — like Colorado, Iowa, Michigan and Minnesota — where Republicans really should be in better shape than they are, but this race may eventually become competitive anyway. For now, it’s LEANS DEMOCRATIC.